The final weekend before the start of the summer movie season presents a complicated group of four new films, ranging from broad family comedy to what may be the most controversial film of the year. Although Robin Williams starring in a film like RV may be upsetting, that's not the controversial film I'm talking about. Following in the depressing footsteps of Steve Martin and his Cheaper By the Dozen films, RV has Williams as an in-crisis father who decides the best way to reconnect with his family is to throw them all into a confined space and drive them across country. Episodes of American Justice have arisen from just such a scenario. This kind of comedy has seen a resurgence of late, what with the first Cheaper by the Dozen's $27 million opening weekend in 2003. The formula seems to be, take an established comedy star known to boomers, add a teen star for the kids (in this case pop star JoJo), mix in bodily function jokes and serve lukewarm. Directed by Barry Sonnenfeld, you might think there's some hope for RV, but then there's those memories of Wild Wild West and Men in Black II. On the other hand, the family audiences seem to eat this up, so who are we to argue? I mean, unless you expect another Good Morning, Vietnam out of the guy, which seems exceedingly unlikely at this point. A proper assessment of Williams's star power is kind of tough at this point considering it's been a full four years seen he's appeared on-screen as himself in a comedy (and almost ten years since one of them was a hit). Sony seems to have a great deal of confidence that he can pull people in (and to be fair, he was the main reason behind the success of Robots), opening RV on a truly massive 3,639 theaters. I look for this one to come in with about $19 million. 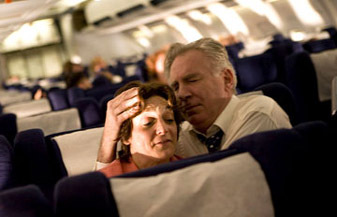 United 93 is probably one of the most provoking films of the year just by its very existence. A retelling of the events of the World Trade Center attacks and specifically those aboard United Flight 93, the only one to miss its target, the short four-and-a-half years between the incident and now strikes many as galling. For others, no amount of time could probably be enough to portray the incidents on-screen. Others may view the film as therapeutic. It's a depiction fraught with peril for Universal, who must walk a tightrope lest they slide into offensiveness. Directed by Paul Greengrass of The Bourne Supremacy, it stars a cast of mostly unknowns, with some key on-the-ground characters playing themselves. Reviews, which are absolutely critical to whether the film hits or flops, have been nearly universally positive. Most are praising it as an unflinching look at the day's events that doesn't attempt to exceed its boundaries, making no extraneous political points. And yet, without sounding crass, the film is ultimately intended to draw an audience, if not strictly to be "entertainment". It's not hard to imagine that a huge number of people have no interest in the film no matter how good it's purported to be. On the other hand, it's hard to imagine a subject with greater awareness. Universal is hedging its bets here, launching the film on a modest 1,795 screens. I think that curiosity will win out to a degree here, propelling United 93 to a weekend of about $16 million. Stick It is the film this weekend for teen girls and horny guys and is an unofficial follow-up to Bring It On, coming from the same writer, Jessica Bendinger, who moves up to the director's chair here. Instead of the world of high school cheerleading, this film covers competitive gymnastics. Missy Peregrym has the lead role in the film, as a rebellious alt-grrl who is sentenced to return to her gymnastics academy after a bout of lawbreaking. This must be that alternative sentencing they talk so much about. Anyhow, since she walked out on her team on the eve of the Nationals, this has inevitably earned her some enmity from her former and future teammates, and is the tension that drives the film. It's a cute, fun-looking film filled with attractive-looking people, and knows its target audience well, with a slick, upbeat trailer. Peregrym is no Kirsten Dunst, of course, and the film will probably suffer a tad in comparison to that film's surprising $17 million opening weekend. It opens on about 2,000 screens, which should get it to around $13 million.